In this spirit of mixing things up a bit, the four reviews below are written by people with very different profiles. See also Sally Marlow’s interview with the festival’s creative director and curator, Ruth Garde. Alina Ivan is a psychology postgraduate and research assistant working on the RADAR study at King’s College London, which uses smartphone and wearable technology to monitor conditions such as epilepsy and depression. She reviewed ‘Headtrip’, a binaural immersive depiction of a depressive experience. Sat in a circle with our headphones on, blindfolded, we are taken on a journey. The morning alarm sets off, the rustle of the duvet. A male voice uttering fleeting thoughts then emerges, mixed with the radio news in the background. A very normal day. The thoughts we then start to hear become a battling internal dialogue; as time passes it becomes more and more punishing, culminating into war. This is a taste of Headtrip, a 10-minute audio experience that takes you on an incursion through someone’s daily struggle with depression. The piece felt very real, incredibly rich, and uncomfortable at times. Once the audio finished, the Headtrip team – Lucia Scazzocchio, Ella Saltmarshe and Rebecca Hatchett – then worked with us to explore our thoughts and feelings, and any insights from the experience. Rebecca told us how they had co-created the audio alongside people with lived experience of depression, introducing us to Nick – one of their co-creators on the project. Ella talked us through the scriptwriting process and Lucia explained the use of binaural microphones to record the audio. Hidden in the ‘ears’ of a dummy ‘head’, they give the impression of an immersive 3D sound. Although we may have knowledge of what depression involves, many agree that unless you experience it you cannot fully understand what someone goes through. Headtrip has done an impressive job at bringing to life symptoms of depression. This initiative could help to build empathy and put us in a better position to offer support, as well as normalise this serious but common mental health problem. 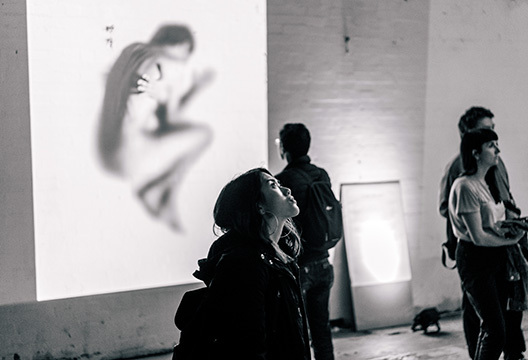 Heroin Bodies (picture above, courtesy of Nigel Brunsdon), product of an interdisciplinary collaboration, first debuted in November 2017 at the pop-up Museum of Drug Policy celebrating the 50th anniversary event for the UK-based drugs charity Release. Since then the exhibition has reached drug policy and harm reduction conferences. It is reviewed by Dr Rebecca McDonald, a Postdoctoral Research Associate at the National Addiction Centre, King’s College London. The aim of this ambitious interdisciplinary project is to connect the general public with visually stimulating and factually accurate representations of heroin addiction and overdose. The artist and communication designer Galia Rybitskaya and academic lead Basak Tas (from the National Addiction Centre) have been working closely together on this project from its inception. I had the opportunity to see their very first exhibition at the Museum of Drug Policy as well as their most recent at the Arts in Mind Festival. The centrepiece is a dividing wall of images representing the layer of skin, separating the biological ‘journey of the drug’ through the body from the historic, unspoken aspects of drug use that are and have been present within society. Photos do not do justice to this ‘skin’ and this exhibition. A separate piece, which I found very moving, is an animation of the human body moving to the cyclical sound of breathing that alternates in a fashion that resembles what might occur before and after a dose of heroin. Galia and Basak were so effectively able to take quite complex information to lay audiences, but there were also many aspects of this exhibition that addictions and mental health professionals alike could also take something from. Opioid overdose and its recent epidemic is a complex phenomenon that has stumped many a researcher and clinician. This exhibition thrusts us deep into the biological and social foundations of opioid dependence and overdose whilst simultaneously causing us to take a step back. I look forward to seeing Heroin Bodies in whatever space it finds itself in next, and encourage you to do the same. With maternal mental health a stated priority area for the NHS, and ‘journaling’ becoming so popular that journal has crossed the line from noun to verb, this project – reviewed by artist and mother Amy Dignam – is right on the zeitgeist. Maternal Journal is a project that came out of a shared interest between artist/midwife Laura Godfrey-Isaacs and psychiatrist Professor Carmine Pariante. The focus of the project is to explore the potential of ‘journaling’ as a creative and therapeutic tool to promote good mental health in pregnant women who have a history of mild to moderate mental health problems. During the Arts in Mind Festival, Maternal Journal ran two ‘tester’ workshops offering people an opportunity to have an insight in to the project. Art journaling is a way to explore mood, emotions and experiences over time. The practice of journaling has a real physical and mental health benefit. It has been shown to strengthen our immune system and lower hypertension, and is also associated with a decrease in depression and anxiety. Throughout the workshops participants were encouraged in making, drawing, working with text and playing with words. Artist Fran Burden opened the first session by leading a concrete poetry workshop – poetry in which the meaning is conveyed partly or wholly by visual means, using patterns of words or letters and other typographical devices. This type of poetry has been used for thousands of years, since the ancient Greeks. A significant word search began attempting to tell a story in a few words. It was an authentic and strong sharing experience, where women’s true voices came through and inspired. Project founder Laura Godfrey-Isaacs facilitated the afternoon session. She asked participants to concentrate on personal feelings. Something that might have happened in the past or just to focus on the way they felt there and then. Starting with eyes closed, participants were asked to make lines on their journal adding layer to layer, changing colours and media as they built up to the final image. The result was always an unpredicted one just as unpredictable as the dialogues and connections made along the way. These expressive modalities of communication and the translation were often difficult feelings for the participants. However, the Maternal Journal provided a safe, non-judgemental environment, a space of acceptance, acknowledgement and tolerance of vulnerability highlighting the need for a holistic approach to mental health issues as a viable alternative to the current clinical model. … reviewed by Sushank Chibber, who has a Master’s in Africana Studies from Stony Brook University, New York. Chibber is doing cancer research in London and pursuing his second master’s at Goldsmiths University of London in social anthropology, focusing on access to healthcare in Europe for refugees, and mental health. He submitted his review in the form of a letter to the artist. I wanted to congratulate you and thank you for an amazing event yesterday. Your event was so innovative and really brought art and science together. I learned more about the mind, ADHD and how important art is in navigating various outlets and that was even more valuable to me than what I would have learned in a classroom setting. The connection between art and science is so essential, and you were able to impact and educate individuals so effectively and bring awareness at the same time. Your event encouraged everyone to step outside of their comfort zone and try to understand their own inhibitions in terms of ADHD and of other people as well. For instance, I talk excessively and get distracted very easily due to my ADHD. However, during your event my engagement with other participants made me more aware of my ADHD. Hence, I tried harder to pay attention and give the other person for of a platform to talk. By doing so I did not only overcome my own limitations but was able to meet and interact with people just like me but also learn how our individual journey in terms of our ADHD can be understood individually and collectively as a group. I hope that you continue to get funding and make your vision even better and more accessible to all. Due to my ADHD, I have always struggled making friends or having access to specialists ,and your event was able to break both barriers and provide a ‘family’ as well as imparting useful skills in return. Art in that case served as a process to educate me and to connect me with people that are just like me, something that I am extremely grateful to you for. Thank you and I look forward to your next event.